Check out our 30th Anniversary Holiday Greeting Card, as well as other Abracadabra custom greeting cards from the last 30 years. Here is a small video preview of our Video Demo-Reel. For more examples of our video services, check out our Corporate Video page. Abracadabra's Video Department has produced entirely in-house a DVD documentary currently for sale at select retailers. For more information, check out our Corporate Video page. Here are just a handful of the unique destinations where we have helped our corporate clients stage successful meetings. For more information, check out our Event Staging page. 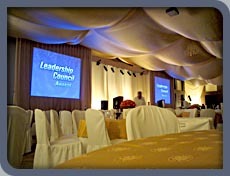 In addition to large-scale corporate meetings, Abracadabra is availabe to support your small event Audio-Visual needs with a variety of projection and sound equipment geared toward smaller budgets. 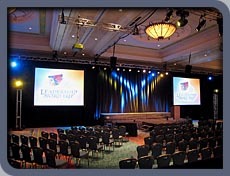 For more information, check out our Event Staging page. Abracadabra is a full-service Presentation Support group specializing in Event Staging, Corporate Video and Presentation Design. We serve a variety of clients, local as well as international, from our Santa Ana location in the heart of Orange County, California. Among the pages of our website, Abracadabra.Pro, you'll find samples and explanations of our presentation services relating to every facet of corporate theater and business communications. 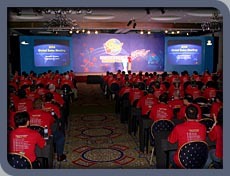 We are professional, creative, flexible and customer oriented in our pursuit of unique and innovative presentation solutions. 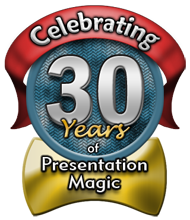 Since 1979, the Pro's at Abracadabra have been dedicated to creating compelling presentations and successful meetings for our corporate clients. Contact one of our Pros to find out how Abracadabra can support your presentation needs. 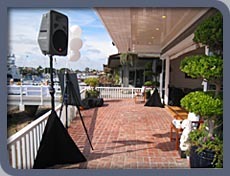 Staging solutions geared toward the flawless execution of your critical business meetings - professional, experienced detail oriented technical operators. Comprehensive in-house video production includes script, location and studio filming, editing, motion graphics, digital video capture and file encoding. Presentation design support at any stage of development including custom PowerPoint designs and graphics, meeting and theme logos, presentation consulting, embedded video, animations and programming, PowerPoint formatting and clean-up.